When people are passionate about something it’s not just part of their life it’s a way of life. For Rosemary, music is her passion and since the age of 9 when she first picked up a violin it’s been a way of life. While violin is her primary instrument she is also well versed in the viola and cello. While her musical inspirations stem from classical, fiddle, and rock music, being raised in a musical family built her interest and supported her thirst the learn and perfect her craft. Throughout her youth, Rosemary played in youth orchestras and string ensembles which provided her with a great platform to experience live performance and work with a variety of other talented musicians. Rosemary took her love of music into her post-secondary education at Cambrian College in Sudbury where she graduated with a diploma in violin performance. While studying at Cambrian, Rosemary played with the North Bay Symphony Orchestra and Haledette Trio. Upon graduation from Cambrian College Rosemary took a position as conductor for the New Strings Youth Orchestra, now known as the HWDSB Strings Program, run by the Hamilton-Wentworth District School Board. Through this position Rosemary teaches beginner and advanced level orchestra, a post she still holds today. After moving to the Hamilton area Rosemary formed Rosetta Strings, a duo that performs classical music as well as pop music with a unique personal style. Rosetta Strings has performed at weddings and other events throughout Ontario and has grown into a trio and quartet as necessary for specific events. Rosemary also works as a freelance musician throughout the Hamilton/Burlington areas contributing to albums and live shows with some of Southern Ontario’s best musicians. While that might seem like enough to keep one person busy, Rosemary also teaches strings and theory at Long & McQuade, various HWDSB schools and in her private home studio. This year Rosemary established two new orchestra ensembles for the Burlington area, which combines students from her numerous endeavours and provides them with the opportunity to explore the world of chamber music, and to practice and perform with other string musicians. Conductor and musical director of Garden City Orchestra, Bumblebee Orchestra and HWDSB Junior Orchestra. Teaching violin/cello classes, junior and senior orchestra for HWDSB Strings program for 10 years. Founder of Rosetta Strings (performing at corporate functions, weddings, funerals and other events). Teaching violin, piano and theory privately at home and Long and McQuade’s preparing students for concerts and exams. Over 25 years of experience studying and playing violin. Diverse background in the studies of pedagogy, conducting, music history, theory, harmony, and business. Studied Violin Performance in Sudbury with Dr. Metro Kozak. Studied sociology and women studies at McMaster University. In 2015, Rosemary won the Hamilton Music Award for Best Music Instructor. Loretta was born in Oshawa, and began playing piano when she was 5 years old under the instruction of her older sister Theresa. Learning more about music and other instruments she literally ran away and soon steered her main focus from the piano to the cello which she has now been playing for just over 20 years, playing in all sorts of community pit bands, quartets, trio’s, duo’s and youth orchestra’s throughout Southern Ontario. To name a few: The Oshawa Youth Orchestra, The Orno Youth Orchestra, Rosetta String Duo, The Sinfonia Sacra, and the Hamilton Philharmonic Youth Orchestra. She graduated from Mohawk College for Cello and Trumpet as well as performance and theory in the 3 year Classical/Jazz program in Hamilton, Ontario. She played in many of the ensembles within the school including the Mohawk College Big Band as a lead trumpet player for 2 years, a jazz orchestra, a cello duo, and playing in ensembles of the jazz, funk, and fusion persuasion. Loretta teaches at Long and McQuade and privately. She also performs with the Andre Bisson Band and directs a local big band – The Loretta Hale Big Band. Aside from that she enjoys doing recording sessions, playing with other bands/ensembles in need of a string touch, as well as anything else that comes her way. 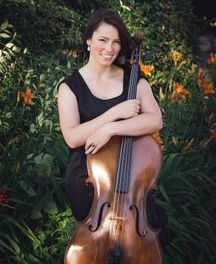 Sarah Honeyford is a fantastic cellist who grew up in Hamilton, Ontario, studying under Marsha Moffitt of the Hamilton Philharmonic Orchestra. After starting on the violin at age 9, Sarah discovered her passion for the cello and quickly became one of the leading youth cellists in Hamilton. Over the past 18 years she has had an variety of performance and teaching opportunities. 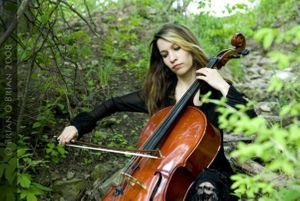 She has performed throughout Canada and the United States as principal cellist of the Hamilton Philharmonic Youth Orchestra. She has had the opportunity to perform as a special guest alongside the Hamilton Philharmonic Orchestra as part of a series of concerts featuring young local musicians. She was also principal cellist of Westdale Secondary School’s prestige string program along with several other small ensembles. 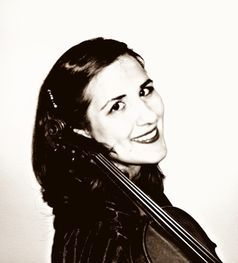 Sarah currently performs with a variety of local orchestras as well as with Rosetta Strings for weddings and events. She has also enjoyed her experiences playing with and recording for local Hamilton bands and artists. After receiving her undergrad from McMaster University, Sarah went on to pursue her passion for education at Brock University’s Teacher Education Program. As an Ontario Certified Teacher, Sarah is qualified for instrumental music for grades 7-10 as well as primary/junior vocal music for grades K-6. She is currently working as the System Itinerant Instrumental Music teacher for the Hamilton-Wentworth District School Board. Sarah teaches both cello and violin privately at her home studio in Hamilton. She also teaches group and private cello classes as well as orchestra for students in grades 4-8 in the Hamilton-Wentworth District School Board Strings Program. Bonnie Bell began studying violin at the age of 9. Currently, she holds a Grade 10 certificate from the Royal Conservatory of Music. As a student, Bonnie gained recognition as Concert Mistress and soloist with the Hamilton East Chamber Ensemble, and for her membership in various school and youth orchestras. Bonnie went on to win many awards at local music festivals, including being a senior finalist at the Hamilton Kiwanis Music Festival in 2004. While living in Montreal in 2008-2009, Bonnie was a member of the first violin section of McGill University?s I Medici orchestra. Bonnie has been closely involved with the Hamilton-Wentworth District School Board?s Strings Program as a teacher since 2002. She has also taught alongside various professionals in the Hamilton area: at The Music Stand and Avalon Music Academy, as well as providing private instruction in her home. Bonnie is the solo violinist in the Acoustics, the award-winning Canadian Instrumental World/Roots musical ensemble. In August 2007, Bonnie recorded two instrumental pieces with the band for December Songs, a Design Hope project. In August 2009, The Acoustics traveled to Nashville Tennessee to perform at the Just Plain Folks Music Awards Nominee Showcase, where their second CD, Forever and a Day received a second place award for World Album of the year. Bonnie has performed at countless weddings and functions. Her musical repertoire is extensive, and her ability to arrange popular music for solo or group performance is appreciated. Trina Nadeau grew up in a musical family, being nurtured to grow in piano and cello. She studied with Nancy Wharton from the Kichener-Waterloo Symphony, and went to Eastwood Collegiate for the enriched arts package program. Trina played with the Kitchener-Waterloo Youth Symphony and started playing for weddings and events in a quartet called Sixteen Strings. She later joined the Kitchener-Waterloo Chamber Orchestra, and then pursued music at Mohawk College in the Applied Music Program, studying under Marsha Moffitt from the Hamilton Philharmic Orchestra. Being surrounded by jazz and more popular music ensembles in this program, Trina branched out and embraced a more alternative side to her cello. Joining the band Ophelia Syndrome, she was soon playing shows throughout Southern Ontario. She also began teaching at the Merriam School of Music. Since this time Trina has joined two more groups, a Celtic/World/Folk music group called, Quest for the Past, and a popular music group called, The Colour Tasters. Trina also performs with singer songwriter Michael Gabriel. Trina continues to play as a freelance musician for weddings and events. She also continues to teach music privately. She loves her incredibly busy music filled life, juggling 3 groups, orchestra, events, and everything else that she does is music to her ears. 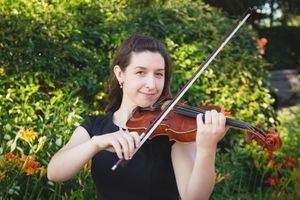 Elizabeth Tremain is a Hamilton native who began playing violin at the age of 8 through the Hamilton Wentworth District School Board Strings Program. She has returned to Hamilton and now teaches for the program. 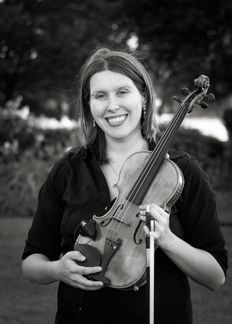 Elizabeth attended Wilfrid Laurier and studied with Jeremy Bell and Steve Sitarski earning her Bachelors degree in Violin Performance in 2007 and a Diploma in Chamber Music in 2008. She has had the pleasure to participate in masterclasses with many great artists including James Ehnes, Jasper Wood, Martin Beaver, and members of the Julliard and Emerson Quartets. Elizabeth is very thankful for the support that she has received from so many people in her life, and hopes that she can give back to her community through her teaching and her performances. Native of Japan, Shiori began her music training in piano at young age but later found a very strong attraction to the clarinet during high school and thus proceeded to serious training at Cambrian College in Sudbury, ON. 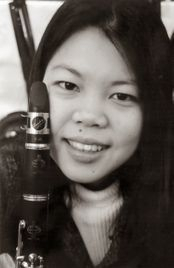 Here, she completed her Performance Diploma and later continued her studies at Brandon University in Manitoba where she complete her Bachelor of Music in Clarinet performance. She recently graduated from McGill University with Masters Degree in Clarinet Solo Performance. As a solo and chamber player, Shiori has performed around the world including Ontario; Manitoba; Saskatchewan; Victoria: Nova Scotia; Alabama, USA; and Japan. She has performed with various ensembles including the McGill Wind Symphony; Brandon University Symphonic Band, The Sudbury Symphony Orchestra, Sudbury Jubilee Folk Ensemble, the North Bay Symphony Orchestra as well as a founding member of the well-established Ricordanza Trio. Shiori has over 10 years of experiences as a private instructor, where she has taught clarinet, recorder, piano and music theory to student in all ages and levels. She also worked as a band clinician, where she visited public schools on a regular basis to assist and help individuals with their struggles and to introduce the joy of playing a woodwind, brass or percussion instrument. Shiori continues to be dedicated towards developing a musical community through private teaching, as well as sharing her love of her music through performing.